This might be premature but those of you already running one of Bob's new tube offerings have any experience rolling signal or power tubes? I'm looking for comments or thoughts on what you may be doing. I'd like to get a head start thinking about rolling tubes into the CF build. This is assuming there 'might' be some similarity between circuit designs of the new CF amp and his 305/350 pieces already in production. 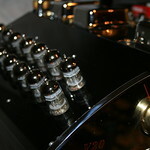 For 12AX7s I have RCA, Sylvania, and I think my HK A500 amp has Telefunkins I can borrow. I've been looking for Mullards, but they are pricey. For power tubes, I have a set of Tung-sol re-issue(Russian) KT-88's I can try, but probably go with KT-120's for the extra watts. EDIT: I posted to quick. I don't have one of Bob's big tube amps. Still interested in what others have tried.